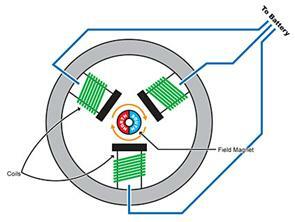 Electric motors are based on magnetism and specifically electromagnetism. They work by taking advantage of the condition where magnetic poles attract and repel each other, i.e., a north and a south magnetic pole are attracted to each other and two south poles or two north poles repel each other. Electric motors are made with magnets and electromagnets and there are many variations as to how they work and are constructed. 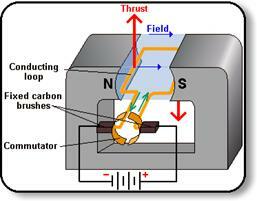 The objective of an electric motor is to get mechanical energy from electrical energy. The principal behind this is to spin one magnet (rotor) within one or more stationary magnets (stator) by alternating the polarity of either the rotor or the stator. There are two main types of electric motors, these being Direct Current (DC) and Alternating Current (AC). The difference between these two is how the current is deployed to the motor. In a DC motor the current flows in one continuous direction and the reversal of polarity is created in the rotor. In an AC motor the current alternates direction and this creates the reversal of polarity, whether it takes place in the rotor or the stator. Whichever element receives the electric current is called the armature, meaning that in a DC motor the armature is the rotor, and in the AC motor the armature can be either the rotor or the stator. Because in a DC motor the current needs to pass through the rotor, there needs to be a physical connection between the current and the rotor. The connection involves two ‘brushes’ that remain fixed in place. One brush delivers the negative polarity and the other delivers the positive polarity. The rotor has two contact points (commutator) that alternate their connection to the brushes as the rotor spins, thereby creating an oscillation of polarity within the rotor. However, brushless DC motors also exist that use an electronic commutator system rather than a mechanical one. With an AC motor, the alternating polarity can be achieved by connecting an electrical current to either 1) the rotor or 2) the stator. This second type is known as an induction motor. An electrical generator functions exactly the opposite of an electrical motor. In this case mechanical energy is converted to electrical energy using the same principals as the electric motor, only in reverse.